I hope all is well! 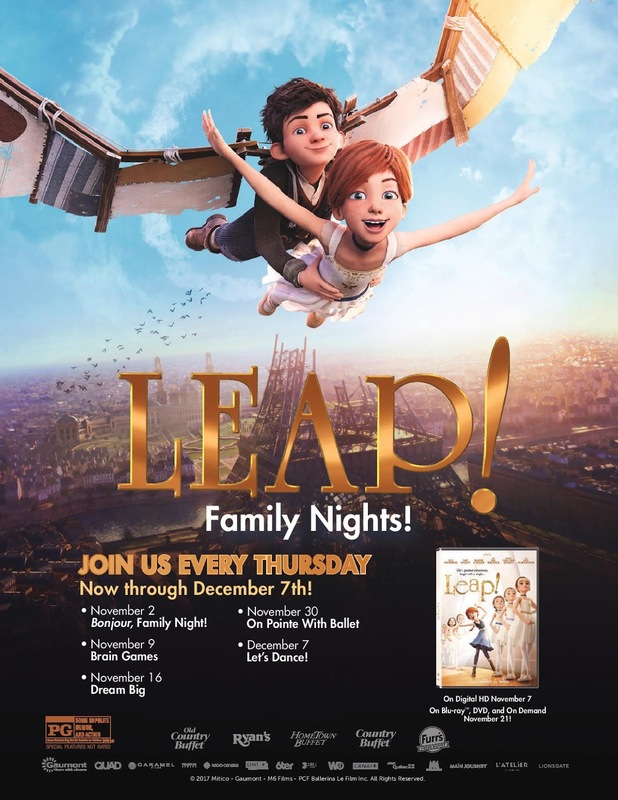 Ovation Brands’ portfolio of restaurants Old Country Buffet, Ryan’s, Hometown Buffet, Country Buffet and Furr’s Fresh Buffet are rolling out a new Family Night promotion featuring the popular movie Leap!. The movie is about two best friends, Félicie and Victor, who hatch a plan to escape from their rural orphanage in 19th-century France. Félicie dreams of becoming a ballerina, while Victor wants to use his brainpower to invent things. After busting out, Félicie makes her way to the Paris Opera where she joins a class of highly-trained dancers who are auditioning for the lead in a production of "The Nutcracker." Each Thursday, from November 2nd through December 7th between 5 p.m. and 8 p.m., kids may participate in different interactive and educational activities in Ovation Brands’ restaurants and Furr’s Fresh Buffet locations. PLUS kids eat for $1.99 from 4 p.m. to close with the purchase of a regular-priced adult or senior meal. · November 2 – Bonjour, Family Night! Win a special prize pack, which includes the following: four (4) free meal passes for you and your family to enjoy a meal at any of Ovation Brands’ locations as well as one (1) Leap! DVD. I like spending time with my kids and having fun. I love everything about family night! The company, food and activities. I like that there is something for everyone on Family Night. Like spending time with family and having a great time. I like spending time with my family a finding out whats happening in their lives! I not only love the food at Hometown Buffet, but the activities for the kids are great too! I like that my kids are occupied with the games during family night so I get extra time to eat! My kids love the games and the fact that I allow them to eat whatever they want...Which means plenty of cotton candy! I like family night at Hometown Buffet because my kids have so much fun, and they learn something at the same time! Family night is fun for my kids because they get to eat whatever they wish, which usually means cotton candy and nacho chips. I figure every once in awhile can't be that bad! Not only do the kids love the food, and treats, the games are fun and entertaining! I like family night at Hometown Buffet because my kids enjoy it so much. They love the food and the activities! Family night is fun because of the activities that Hometown has for the kids. They usually get done eating before me so it gives them something to do while I finish! I love going out for the night with the family and the kids love the treats they get. Both my kids love family night for the activities and of course the cotton candy! Plus, they like going to Hometown because I let them eat whatever they wish...No rules! Family night is great for the kids, they get to learn some new things and eat whatever they wish! I love the games they have during family night and also the price they charge for the kids' meals. Hometown Buffet not only has great food, but they put on a good show for the kids on family night! Both my boys love the activities and eat really well when we visit there on Thursdays! Family night is great at Hometown because they have great activities to keep the kids occupied while I eat the great food! I love that its educational and that kids eat FREE!! My kids like the games and cotton candy that they have during family night. It's nice that the kids actually learn something too!